Monday was another snow day, this one covering up a layer of ice, so that meant no biking for me and a whole lot of hoping that all road surfaces would miraculously melt and dry for Tuesday’s commute to campus. Sure, I could grab a ride with a friend, ask a student for a ride home, but I want to ride my bike and use my train pass and be in some control of my own movement–plus I’m really stubborn–so I layered up and left early so it I had to walk or wait for a bus, I’d have to time to do so. The ride down the hill was fine, though I could feel (and hear–quit honking your horns people, there’s nowhere for me to go!) the irritation of drivers as I took a whole lane in morning traffic because the bike lane was filled with plowed remains. I belong in the road on my bike, but I’m not one to inconvenience others (see above re: asking for a ride), so it goes against my nature, but I just talk myself through it: “I know you don’t want me here, but you’re going to have to go around me, because I’m here, and I belong here.” I actually do talk out loud to myself in those situations, and it works to get me self-righteously lane-take-y. And then I took my right into the station, promptly getting off to walk, because that turn was still an ice sheet. First part of the commute: done. I caught up on work emails while the train took me 6.5 miles and then it was the ride through Arbutus to campus. Brompty and I alternated between salt and the mini-lanes left by car tires, enough room–just barely–so I didn’t have to get off and walk. I changed out of my rain pants and into my skirt, and after a long day at work, let class go 15 minutes early in case nightfall had turned my roads into black ice slicks. The day had cleared out most of the ice, though, and it was a quick and safe ride to the train. Success! A safe multimodal commute on the iciest day of the winter! I got this! And then I waited for the train. And waited. And got on and we went just far enough so we couldn’t get off the train and then we waited again. No trains were moving north due to police action at Martins, so we waited. And waited. I texted N. to apologize for being late for our dinner date and she advised me I might not move for awhile–her earlier train was held for an awfully long time. What are you going to do? I rummaged around in my bag for a snack–I have no idea how long that stroopwaffle had been there–and chatted with my colleague M. about his baby, my cats, why we like the train more than cars (contact, it’s all about contact, though this conversation was a good example of the blurred lines between contact and networking–all the topic of the class I’d just sent home early), how long he waited for a bus that never came before getting on a train that never moved, that tricky thing where buses won’t get better until more people ride them but more people won’t ride them until the buses are better, why we both think 19th century German philosophy is really important and fun to read, my brother’s blog, how we were going to get from the station to home, and then the train moved, we pulled into Penn and said our goodbyes, and N. picked me up for our dinner date. 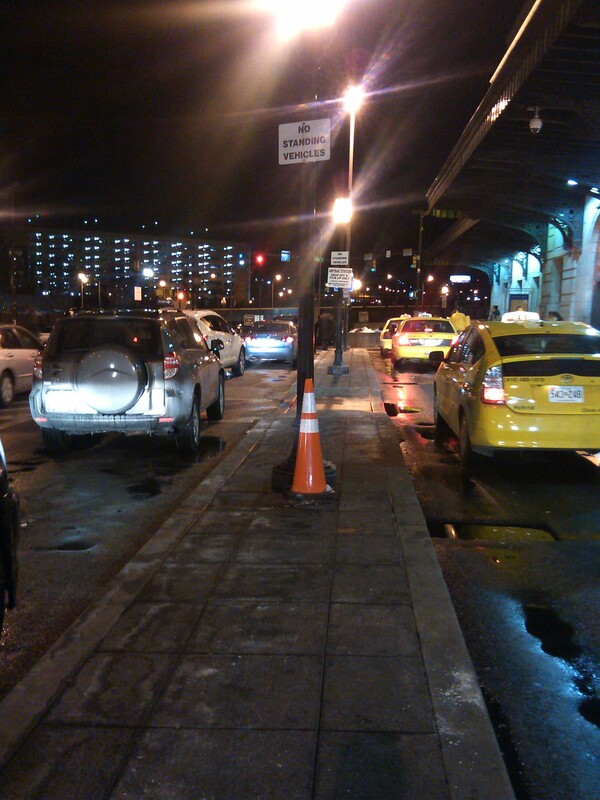 I snapped this picture of cars and taxis waiting, waiting, as I waited for mine. Lots of us were having the same sort of evening, and somehow that made it better. This entry was posted in commuting, personal, weather and tagged Arbutus, Baltimore, Brompton, cold weather, commuting, contact, Penn Station, UMBC. Bookmark the permalink. Yes yes yes to taking up the lane! It’s not always easy or perfect but it’s often safer than hugging the right and risking getting clipped. You are one tough monkey, Kate. Baddass, for sure. Great to run into you yesterday Kate! It made the disastrous commute much better than it would otherwise have been.